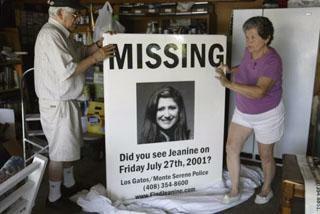 Jesus and Georgette Sanchez take a large poster of their missing daughter, Jeanine Harms-Sanchez, out of storage from their Campbell home in July 2003. A suspect was arrested today in the case. Police have charged a man with murder in connection with the 2001 disappearance of Los Gatos resident Jeanine Harms, the Mercury News has learned. The man who was arrested, 40-year-old Maurice Xavier Nasmeh, was seen with Harms shortly before police believe she disappeared on July 28, 2001. The two of them were seen buying beer at a convenience store near her house late at night. The Los Gatos-Monte Sereno Police Department scheduled a noon news conference to announce the arrest. Sinunu said the big break came when a woman responded to a picture in the newspaper of a rug that was missing from Harms' apartment. She said ``very sophisticated'' forensic lab analysis on the rug fibers tied Nasmeh directly to the crime, when combined with physical evidence gathered from numerous other sources. Harms' body has never been found. Nasmeh was arrested this morning by Los Gatos police in San Jose shortly after he left his home. Staff Writer Connie Skipitares contributed to this report. Contact Chuck Carroll at ccarroll@mercurynews.com or (408) 920-5206.